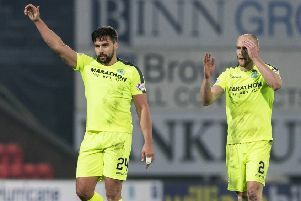 Jason Cummings and Franck Dja Djedje are set to form a new-look strikeforce for Hibs against Falkirk tomorrow after young Scot won his fight against a ban for an alleged offensive gesture in the derby. The 19-year-old was booked by referee Steven McLean for his celebrations after scoring the opening goal at Tynecastle, his third strike in as many games as he took his tally for the season to nine. However, the SFA’s compliance officer Tony McGlennan later stepped in with a retrospective charge against the former Hutchison Vale forward, offering him a one-match ban for making an offensive gesture which, if accepted, would have resulted him sit out the visit of the Bairns. However, the Capital club chose to reject the offer and their stance was vindicated, as a judicial panel at Hampden returned a not proven verdict. The news comes as a boost to head coach Alan Stubbs as he was already without top scorer Dominique Malonga, who is currently on international duty with Congo as they prepare for the Africa Cup of Nations in Equatorial Guinea. Now Cummings looks set to partner Dja Djedje, the 28-year-old Ivorian who agreed an 18-month contract with Hibs earlier this week. On-loan Dundee forward Martin Boyle will also come into Stubbs’ thoughts, with veteran striker Paul Heffernan seemingly on the fringes of his plans having started just four matches this season, the last of which was the 1-0 defeat away to tomorrow’s visitors last month. Meanwhile, Hibs are set to land an £18,000 windfall via the European Club Association thanks to Jorge Claros’ inclusion in the Honduran World Cup squad. Claros played in all three of Honduras’ matches in Brazil last summer, although they bowed out at the Group stages.